Sometimes I feel like there is just so much happening at and around Carnegie Mellon, featuring our students and alumni, that it is impossible to actually soak it all in. If we wanted to have the fullest college experience possible, doing and seeing all of the coolest stuff, we would probably have to stop going to class and doing our homework. But we can’t so we prioritize what we like and what we can afford, letting so much fall by the wayside. For me, Eastend Mile was one of those things. I’ve heard of the band. Two of its members are current students, and one is an alumni. I’ve been invited to their shows on Facebook quite a few times, but, because there are only so many hours in the day, I usually ignore the invite (sorry, guys!). But let me tell you here and now: Go see these guys. Make it a priority to see an Eastend Mile show. I have to admit, reading “contemporary jazz sound for a new generation” on their website did sort of concern me. It gave me flashbacks to the hours I’ve spent trapped in the car with my dad listening to NPR. I’ve always found jazz, or at least my dad’s jazz, to be so irritatingly dissonant. Perhaps I’ve been ruined by Top 40, or I’m not as intelligent of a music-consumer as he would have liked, but something about jazz has just always gotten under my skin. What really bothers me is that there are upwards of six instruments that don’t always feel like they’re working towards the same goal. It’s like One Direction, several units all going different directions, not really on the same page. But what was great about Eastend Mile, and what has made me a contemporary jazz convert, is that we have all classic jazzy instruments — saxophone, keyboards, bass, and drums — but they’re all on the same team here. The instrumentalists were all working toward the same goal, and that goal was making me dance. Holding down the beat on drums was junior ethics, history, and public policy and professional writing double major Dhruva Krishna. To his right was the unsung hero and groove keeper, senior mathematical sciences major Christoffer Thygesen, or Tiggy. When the band originally formed back in 2013, these two hadn’t joined yet. Eastend Mile consisted only of Caleb Lombardi and Roger Romero (COE ‘14). 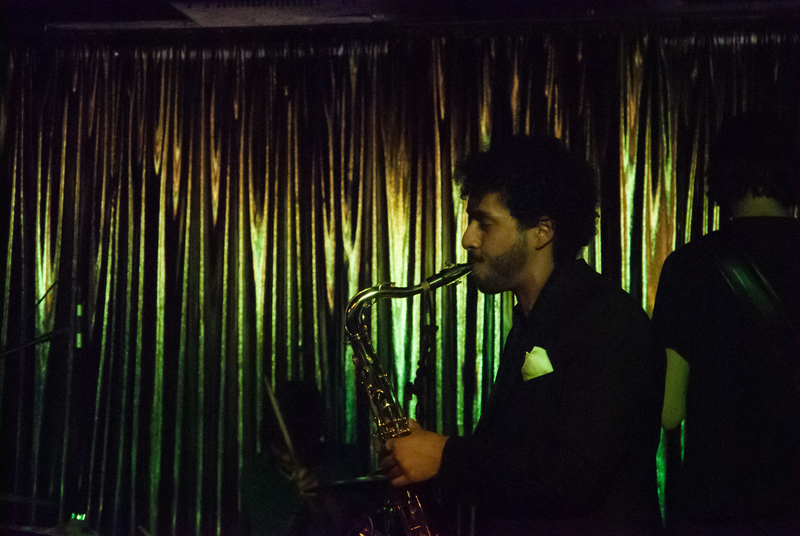 With Lombardi on the keys and Romero on the saxophone, the duo recorded their debut album City Limits, shortly after adding in the beat and groove characteristic of good jazz music. Because there was no vocalist to hide behind, you really got to hear and appreciate the skill of these four musicians. As someone who cannot keep an actual beat, I’ve always just been impressed by middle school snare drum players. Krishna and Thygesen really did more than keep a beat for the group; they weren’t playing back-up, which I feel tends to happen to rhythm instruments. The drums and bass really did carry as much musical weight as the keys or saxophone. I was very impressed by their presence within the band dynamic on stage. And since they don’t have a lead vocalist, Romero and Lombardi split the duty. Lombardi took over the emcee duties, communicating with the audience, introducing songs, and giving shout-outs to the other musicians. I must admit, he and his tiny man-bun really were quite charming. But charm isn’t all you expect from the lead of your favorite band — there has to be some kind of swoon-factor. Enter Roger Romero. I can’t remember him saying anything, but he didn’t have to. All he had to do was finger out a melody and we as the audience knew we were under his loving care. Not only is Romero a technically skilled musician, he is basically a modern crooner. During the song “I’m the Realest” Romero descended into the crowd, playing as he walked, and stopping to make some very intense eye contact with women along the way. Not to brag, but I got a slice of this. What was also really fun about their set was how they used covers. It’s smart to acknowledge that not everyone in the crowd will know original songs, but they will know, and get down to, dance jams like The Weeknd’s “Can’t Feel My Face” and a mashup of Justin Bieber’s “What Do You Mean” and “Sorry.” Not only did I have a great time dancing to these, I felt like it also showed the group’s sense of humor. While some consider these songs pop trash, Eastend Mile saw a good beat and an opportunity to please crowds. And Romero did these tunes great justice, firing out the recognizable melodies. 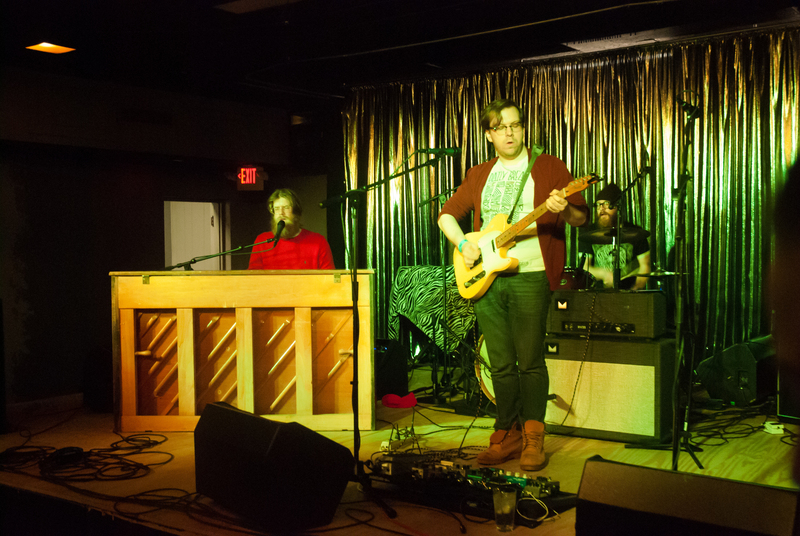 While Eastend Mile does deserve a lot of credit for a great show, I must tip my hat as well to openers, Sea Rights and Wreck Loose, both local groups, as well as booking group Found Sound Music, founded by another Carnegie Mellon alumni and former Tartan staffwriter, Kyle Henson (TSB ‘14). Henson pulled together a great crew and picked a great venue. I highly recommend Cattivo’s beef and cheese fries and four dollar whiskey sours, which both warmed me up on a chilly night. As much as I was dreading bearing the elements on Friday night to trek to Lawrenceville, the night was all-around worth the 4.9x Uber surge pricing.